Of course it’s ridiculous getting a Type 1 diabetic to make sweets — I go into shock. I do, however, have three copies of my book, ‘Dead People’s Music’, to give away. If you live in New Zealand, leave a comment introducing yourself, and I will pick some lucky winners to send the books to next Friday. If you live in Auckland, the Gladstone School Gala is on this Sunday, between 10 and 2. If you come at 11, you might find me on the drinks stand. I particularly like the writing on the T Shirt and the wildlife in the glasses. Some things in life (like silken fudge) seem impossible to achieve — you know it before you start but you still set forth — you capture this mismatch of instructions and end result perfectly. I also recommend Dead People’s Music! Hi Sarah. I’m in Napier. I have 3 daughters. One at Intermediate, one in Year 3 and my youngest has just started morning kindy. I have begun riding my push bike while Miss 4 is at kindy. I go past a winery and the aroma’s are soooo nice. Then 50 metres down further there are sheep. Sheep don’t smell so good. Love the ride though – I feel so free as usually I walk everywhere (and walking is slooow with little legs for company). But these times will soon be over and my girls will all be at school. So I’m appreciating every moment! I’ve read your whole blog. I REALLY really want to go to the park that has music in the trees that you wrote about. Thank you. Hi! Waving from the deep(ish) South. I cannot make sweets, I can bake but no, not sweets. I love this. I too always found that soft ball thing a mystery. I do know what they mean but dang if I could ever get it just so. Having said that my mother was a master. Perhaps we should have asked her to make some and send it up for you. I would leave a bid for the book but I have a copy already. And I loved it. So there. Sugar thermometers are apparently the secret, but I bet those gina hardfaces that rule school galas test boiling toffee with their bare hands. Hi, I’m Moira. I live in Auckland and met you at the AUT Print Fair a couple of weekends ago. I’m one of the people behind Alphabet City, the community printshop, zine library and gallery opening soon in Eden Terrace (as of yesterday: all primed and ready to paint!) Edmond’s fudge is a cross-generational favourite in my family, I’ve been meaning to figure out if I can make a vegan version. I’d love a copy of your book. I have never made successful coconut ice, fudge is much easier! Sarah I have your ‘further complications’ post printed on my office wall and whenever I despair of my day job (research fund management) I look at the ‘action shot’ of you typing a funding application beginning ‘Yo M-F- I am da king. I am da best and you don’t wanna mess…with me’and I realise that the funding applications I’m reviewing aren’t so bad after all 😉 Thanks! 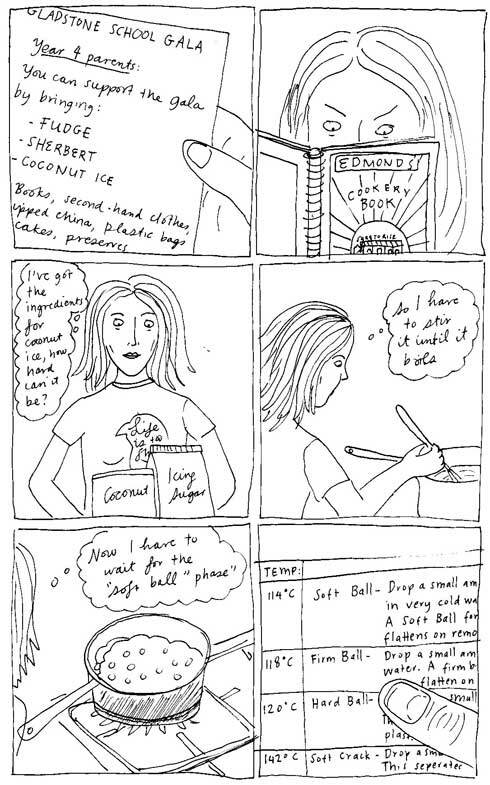 Kia ora Sarah, I’ve been a follower for awhile – this blog inspires me to draw which I am truly, astonishingly terrible at, as I am at making coconut ice. I’m a bit better at writing and am currently obsessed with found poetry. I loved the story of your Dads life. Anyway, I don’t think the kids at the gala will complain as long as it’s packed with sugar. Really great. You’re a really great writer and a really great drawer. (Wow. I lot of ‘really great’s there.) Hey, you were wearing that shirt when you came to Devonport! I too finally found success with cooking sweets when I was given a sugar thermometer. It truly did lead to silken fudge! 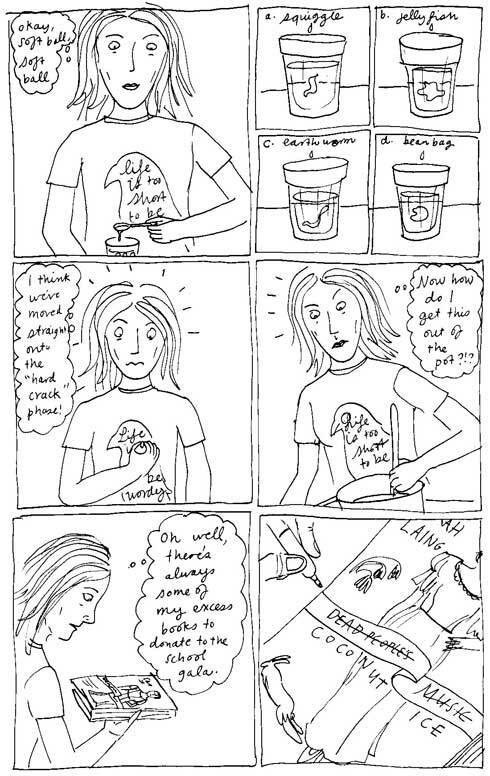 I was sent a free Little Treasures with another mag I subscribe to today, and though I don’t have any little kids any more I was thrilled to see a Sarah Laing comic there. Love your work, and would love to read Dead People’s Music. When I was a kid – The Martin Avenue Dairy benefited from the Gladstone Primary School Gala – the Gala was on a Sunday & so money couldn’t be pulled out on the day – instead – the kids (me & my bro) had to sell tickets. you used your ticket on the day to buy _________. Flush with coin – my brother & I went straight to he Martin Avenue Dairy and spent up large. You could get a heck of a lot of winegums, milk bottles and coke for 5 bucks. My mother couldn’t cook – so we took in cans of spaghetti. Hi, my name is Tim. I sold my copy of Dead Peoples Music for some crack rock and now my sister is really quite mad with me. If I won the copy of the book I could buy some more crack and my sister would be happy again. Hmmm. I think you should probably give the book to Tim. Wait, maybe that would make you his enabler. Ah well, maybe you should just give it to me. I am extremely unlikely to sell it. And if I did, I promise it would be for a good cause (like saving puppies). No crack in the picture. Thanks so much for your fabulous posts. As for introducing myself, I’m a human rights advocate, yoga teacher, writer and now also restauranteur. I sometimes live in Wellington, sometimes in Kapiti Coast. I often stay up too late commenting on other people’s blogs.